It’s time you looked in your garden weeds with a ‘roving eye’ because it is hiding all sorts of nutritional and medicinal gems! “Common weeds” can cure heartburn, cystitis and coughs, and they can also provide you with free protein, vitamins and minerals. Woefully, most gardeners and cultivars alike arduously dig them up, mow them down, or exterminate them in all possible ways. The petals and greens of this common garden flower can be eaten either raw or cooked although some find their flavor a little bitter. Daisies have been brewed into a tea and used in traditional Austrian medicine for gastrointestinal and respiratory tract disorders because they have anti-inflammatory properties. And those daisy chains that kids make around their necks are just loveable too! It is part of the mustard family, and is considered an invasive species in North America. However, it brings with it a lot of great health benefits: aside from being a good source of vitamin A and C, the garlic mustard is good as a diuretic, helps with weight loss, improves heart health, lowers cholesterol, and strengthens the overall immune system. Historically, it was used to flavor salt fish, but it’s also really flavorsome when mixed with mashed potatoes, soups or salads. This garden weed is an excellent source of vitamins C, A, and D as well as of valuable amounts of calcium, iron, phosphorus, potassium, and zinc! The chickweed has a delicate flavor that resembles the one of spinach. It works well when freshly picked and added to sarnies and summer salads. If you dislike the taste, you can still reap its benefits by mixing it in soups and stews. As a medicine, the chickweed can be used as a topical remedy for minor cuts, eczema, burns, and rashes. It is also a mild diuretic, so it is deemed to relieve cystitis and irritable bladder symptoms. The most popular of all weeds, the ‘humble’ dandelion is, in fact, bursting with vitamins A, B, C, and D, as well as minerals such aspotassium, iron, and zinc. There is probably ‘a ton’ of this nutritious weed right in your backyard! The dandelion has been used throughout human history to treat everything from liver problems and kidney disease to heartburns and appendicitis. Today, it is mainly used as a diuretic, as an appetite stimulant, and for the liver and gallbladder. The good news is that every single part of this common weed, from the roots to the blossoms, is edible. Use the leaves in sandwiches and stir fries – they boast more beta carotene than carrots, meaning they are great for your eyesight! Roots can be made into herbal tea, or roasted and ground as a coffee substitute. The sweet flower heads will add vivid color to salads too. This fast growing summer weed produces black seeds which are related to the protein-rich quinoa. Much like their cousin, the seeds of lamb’s quarters are a great source of protein, along with providing calcium, phosphorus, potassium and vitamin A. However, the harvesting of these seeds does take a little dedication. If it seems like too much work for you, don’t get upset – you can also enjoy the young shoots and leaves of the plant. Whether raw or sautéed, they make a great stand-in for spinach since they’re just as nutritious. Medicinally, a tea made from the leaves is said to help with digestion disorders and stomach aches. Although the truly versatile elder is not exactly a weed, it’s quite a common wild tree, especially around riverbanks and lakes. The flowers can be collected in spring to make elderflower cordial, soda or champagne. With a refreshing mild taste, they’re great when paired with pear or apple. Dry the flowers in bunches to make sweet tea. The leaves, flowers, fruits, and root extracts are used by herbalists to treat bronchitis, cough, colds, flu and fever. Studies have shown that the wild plant is effective in treating the flu. Another common weed that can be used topically to treat burns, stings and other wounds. It should not be mistaken for the banana-like Caribbean fruit! While the young leaves are tasty either raw or cooked, the older leaves are a bit tough and unpleasant tasting. A hundred grams of plantain contains the same amount of vitamin A as a large carrot, and is very rich in riboflavin and vitamin B1. Research has shown the plantain to be beneficial for treating bronchitis, sore throats and cold symptoms. It also grows in the wilderness and is considered a weed by some – although a very eye-catching one! The mild tasting leaves and stems of the viola can be eaten either raw or cooked. Leaves can be dried for a tea which has mild laxative qualities, and the flowers can be added to vinegar for a homemade dressing, or simply drizzled over salads. This flower in light blue color survives as a wild roadside plant. Despite its tasting somewhat bitterly, the chicory leaves are frequently consumed in certain parts of Europe. The chicory is well-known for its toxicity to internal parasites and can also be used as a tonic to stimulate your lost appetite, it acts as a diuretic, and it can cure an upset stomach and constipation. It is believed to protect the liver and to be helpful with gallbladder conditions. Maybe you haven’t noticed, but this lovely pinky-red flower attracts all the bees to your garden. It’s not just a great source of food for them, but it is also for you! Due to its anti-inflammatory properties, the red clover has been used as a folk remedy for cancer. However, as the American Cancer Society states, there is no evidence to back this claim up. So, it’s best to use the red clover simply as ‘a well’ of calcium, chromium, magnesium, niacin, phosphorus, potassium,thiamine, and vitamin C.
Since it’s also rich in isoflavones [chemicals that act like estrogens in the body], take it easy on your intake! Small amounts of raw clover leaves, or the flowers, can be added to salads, sautéed or pan roasted. The curly dock is one of the hardiest and most widespread weeds, so you should have no trouble finding it in your backyard, or in the nearest meadow. Its leaves contain vitamin C, beta-carotene, and zinc, ensuring good immunity. But, it is the seeds that are rich in fiber and calcium. The stems of the curly dock can be peeled and eaten both raw and cooked, and the maturated seeds can be roasted to make an earthy, warm drink. It is a very popular medicinal weed, but you’ll need gloves or thick skin to be picking this! It’s used for urination problems and kidney stones, joint ailments and as a diuretic. The leaves are also said to help fight allergies and hay fever. Nettles are rich in vitamins A, B2, C, D, and K and have important nutrients like antioxidants, amino acids and chlorophyll. They’re also a good source of calcium, potassium, iodine, manganese, and iron especially. Boiled nettle makes a side dish similar to collard greens, and is great when added to omelets. You can also make some delicious dips, teas, soups and pesto. The sheep sorrel plant is a close “relative” of curled dock and wood sorrel, and is often found in overgrown backyards. A good source of vitamin C and E, historically the sheep sorrel has been used to treat inflammation, diarrhea and even scurvy. It’s also used to treat urinary tract infections, to maintain blood sugar levels and to support the liver function. This weed shouldn’t be eaten in excess because of the potassium oxalate levels, but small amounts ‘liven up’ soups, salads and stir fries with their lemony and tart flavor. It’s simply great when paired with seafood or chicken. The wild garlic is a great find for all foragers. Just like the ‘tame’ garlic we’re used to buying in stores, the wild variety also features antibacterial, antibiotic, antiseptic and antifungal properties. With delicate white flowers and thin shoots, this useful ‘weed’ is delicious when used in a homemade pesto. It can also be used in place of chives or green onion, and added to salads, sandwiches, or soups. Keep in mind: The wild garlic has been found to have the greatest ability to lower high blood pressure of all the garlic varieties! 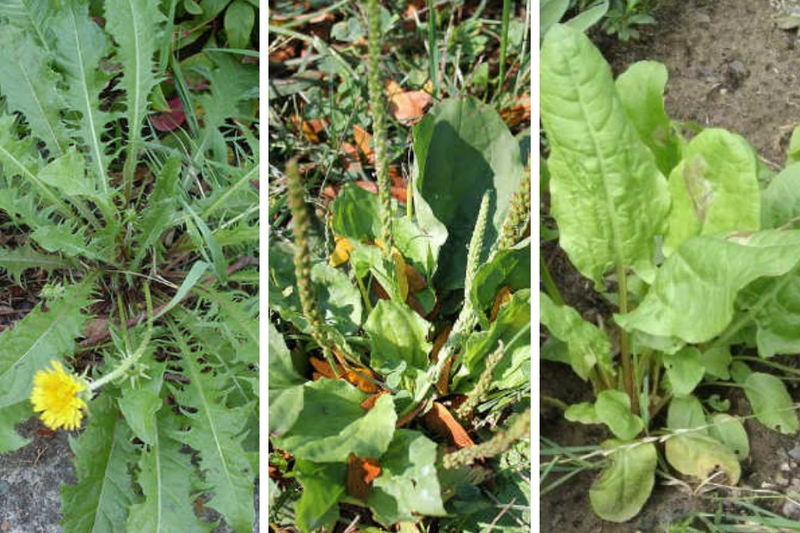 This summer weed is a great source of free protein if you take the time to collect and prepare the seeds. The leaves of wild amaranth are delicious and delicately flavored when pan fried, or added to any dish that ‘calls for’ leafy greens. Culinary prepared amaranth leaves still contain vitamin A, vitamin C, and folate; with lesser amounts of thiamine, niacin, and riboflavin, and minerals such as calcium, iron, potassium, zinc, copper, and manganese. And the grains are comparable to wheat germ and oats in aspect of their nutritional value. NOTE WELL: Before you rush out to pick weeds for your meals or medicinal cabinet, make sure you know what’s what. Many plants look alike, and some have poisonous properties, so it’s always best to be grounded on the subject, that is to take a guided foraging trip and to consult an expert prior any use.